Graduate student at Columbia University. Hija de la diáspora Dominicana, and Latina luchadora contra pendejadas. 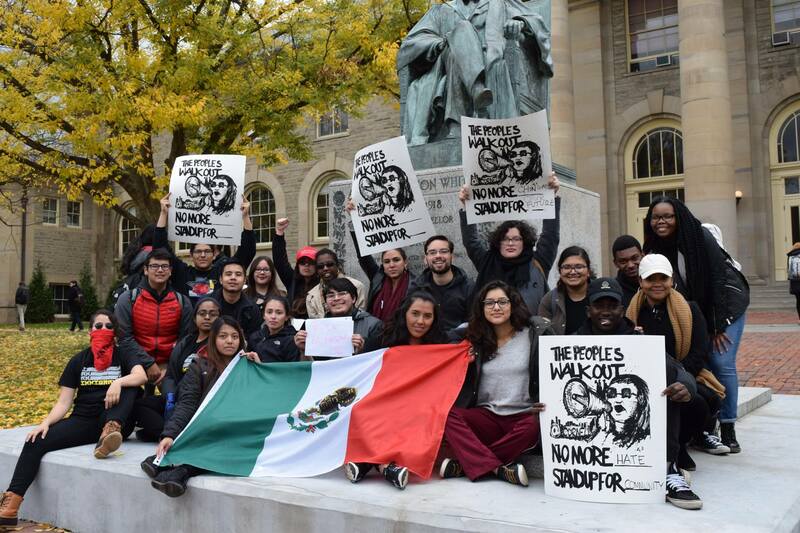 Photo by Emily Dong, student at Cornell University, taken at the November 11th People's Walkout. Far above Cayuga's waters, I am a Senior at Cornell and I am tired of being the teacher of my own race/class/gender/disability-based trauma. Y'all have never compensated us for this extensive emotional labor invested by us day in and day out. We came here to graduate, not to perform your job. We, as marginalized students on campus, are tired of pushing ourselves beyond exhaustion at the expense of our mental and physical well-being to build a community of solidarity so that we can find our homes here; to feel like we belong. Students should not have to be performing the job of the administration. The Africana Studies and Research Center and the Latino Living Center did not result from the inherent altruism of the University -- radical resistance by Black and Brown students within the Willard Straight Hall Takeover of 1969 and Day Hall Takeover of 1993, respectively, built these spaces for us. Whatever resources exist on campus for marginalized students: we fought for, all the while amounting the courage to wake up each morning and head to a class where our white lab partners wouldn't even allow us to carry out lab procedures because they're "too complex"; I was, and continue to be, perceived as intellectually deficient, having "cheated" my way into Cornell because of affirmative action. To those folks: I am here because of programs like the Arthur O. Eve Higher Education Opportunity Program (H/EOP). I am here because of my family and community back home in the South Bronx. I am here because of myself. It is now a normative process to reduce students by the quantity of their debt (or lack thereof) at the beginning of each semester. Students who have taken leave of absences, whether for financial or mental health purposes, find themselves going right back to where they started sometimes. "Any person, any study"-- yes, but how can we truly pursue or take advantage of this motto if we are not given the means to do so? When "person" means white. As a Latinx, low-socioeconomic status, and first-generation student, I do not have access to the same cultural and social capital, inherent financial stability, and intrinsic sense of belonging that other more demographically privileged students have here on campus. I was embarrassed of my papi's taxi cab the first time he drove me to Cornell on move-in day. I resented the way he mispronounced "William Keeton Hall" when trying to find his way around campus. I lament the fact that he's barely seen the place where he sent away his daughter to achieve all of our "American Dream". I continue to mourn that I pray to my mami more than I do to Dios. I hated myself for being too poor, too Brown, and too sad. The resources available on campus that have had the most powerful influences on the lives of underrepresented students -- the Latino Living Center (LLC), Ujamaa, Africana Studies and Research Center, Akwe:kon, 626 Center for Intercultural Dialogue, and so on are delegated, quite literally, to the outskirts of campus, geopolitically decentralized from Central Campus and away from Willard Straight Hall, the established Student Center. The few resources that are actually near Central Campus -- the Office of Academic Diversity Initiatives (OADI), Latino/a Studies Program (LSP) and the Asian American Studies Program (AASP), to name a few, are either afforded a single floor of a building, or at times, half of a floor. It is no wonder that on a campus as geographically large as Cornell, the institutional allocation of these resources on our campus makes it even more difficult for students from historically and socially marginalized backgrounds to seek critical resources that are already decentralized (and often times, underfunded). By the time students get to them, it is often too late. It is also clear that our own peers at times do not feel that we belong; from them we internalize that we are "too poor", that we should be withdrawn from Cornell because of our inability to pay, that our "broken" English is somehow indicative of our intelligence, that we are too angry, and that we are too "triggered" (trigger warnings being stigmatized as "threats" to freedom of speech, which is directly privileged over trauma). Ultimately, we internalize that we simply cannot handle a classist/ableist/racist/xenophobic/heterosexist/cissexist/sexist/anti-immigrant "joke". Quite honestly, we can not "lighten up". Our exhaustion, indignation, and lucha is an institutional inconvenience because it disrupts oppressive, normative, and predominately white institutional (PWI) functions. We have every right to hold you -- the institution -- accountable for your pervasive inefficiencies until they are resolved, until we are heard, and until our physical bodies matter. As callously as you announce to us our debt sentences, we will also denounce you. You cannot tell us the right or wrong way to protest: to keep our lips shut, our gaze low, and our tone polite. There is no moral hierarchy for expressing dissent; try punching someone in the gut and asking them not to scream. Don't you dare decorate your college pamphlets with our skins, only to dispose of us weeks later. As long as institutions continue to tokenize our presence within their websites, future classes of students will continue to be led each year under the false notion that we are indefinitely assured our spots within Cornell and that they shall remain there, too. Their generational dreams of searching for a better life is passed down to them because it's the only thing left to inherit at times. It is not enough for us to simply get to college; we must also get through. My body is not a mere marketing tool to be utilized in order to reel my friends into a perpetual catch-22, where -- ni por aqui ni por alla -- will they "belong." I carry my dreams and my family on my back much as I have learned from my ancestors to do so; there aren't that many breaks along the way. If we must take a break, it's because something has broken. Ultimately, while marginalized students on campus often feel that they do not belong because our image of self does not align with the image of the institution -- predominantly white and affluent -- I'd like to believe that success comes in our shades, too. Recognize, y'all, that the spirit to prevail within isolation runs deep in our roots, directly from our ancestors, long before our own isolation within the PWI. We co-construct our own spaces within Cornell through the isolation of never quite feeling as though we truly fit in, let alone are capable of graduating, within the ivory tower; through that, we belong. Nuestra comunidad es fuerte. This tension between us and the institution has to, and will, be addressed. Until then, we will continue to retain one another ourselves. Recognize that neutrality and silence violently sustains the status quo. Enough has not been done to retain us. We do not fight because we want to; we fight because we have to survive. Days when I cannot peel myself out of bed in the morning, I often wonder to myself if my body can make it to graduation or if my anxiety and depression will consume me whole. I also find myself wondering if these larger capitalistic expectations purely reducing me to what, and how fast, I can produce within this ivory tower will devour my sanity. I do not get up because I want to; I get up because my dream demands to survive, alongside those of my community, and manifest itself into a reality. Institutions of higher education -- Cornell -- if you are going to admit us, then graduate us too. Far above Cayuga's waters, the Ivory Tower tolls for some, but not for "any". Follow my friends and I at Cafecito con Chisme: Latinx Podcast for more on Cornell, Latinidad, resistance, y chisme. Also follow Oblivion Magazine for intercampus narratives written by, and for, students of color.